As of December 2017, Phoenix Fruit Express has no longer been available for showing at exhibitions. Unfortunately the baseboards got mouldy, so the layout had to be dismantled. However, some of the Buildings and Structures are being re-used on our new US exhibition layout, Hamtramck. This page on Phoenix Fruit is therefore only here to serve as a memento to a layout that we had fun building and operating. Some of you may even remember it from previous shows. Phoenix Fruit Express represented a scene in North America where the need to move large amounts of fresh produce from the country to the cities produced some of their largest shipping companies. 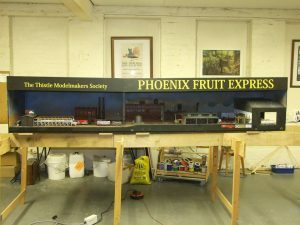 The Phoenix Fruit Express layout recreated the kind of facility that would exist in most major cities where locomotives (diesel shunters and major freight steam) would arrive with their loads of box cars. Cars would need to be unloaded, restocked with ice and sometimes repaired before returning to service. All this work would need to be carried out throughout the night to ensure fresh fruit and vegetables were in the shops by morning. 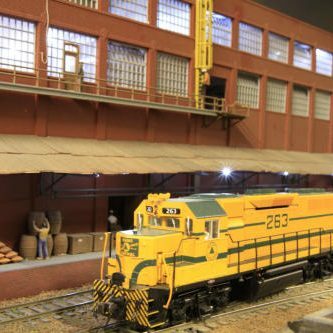 The layout is DCC controlled and has a computer controlled DMX lighting sequence showing a changing scene throughout the night. The layout set up at our previous premises in Causewayside. Someone needs to keep an eye on that electricity substation, if that fails there’s going to be a big problem! This layout has its origins in Pacific Fruit Express, which at one time, was the largest refrigerator car leasing company in the world. It was a joint venture between the Union Pacific, Western Pacific and Southern Pacific and operated between 1907 and 1967. In 1967, the partnership ceased and the company became a subsidiary of UP. A CN SW1200 shifts a Pacific Fruit Refrigerator car down under the control tower. 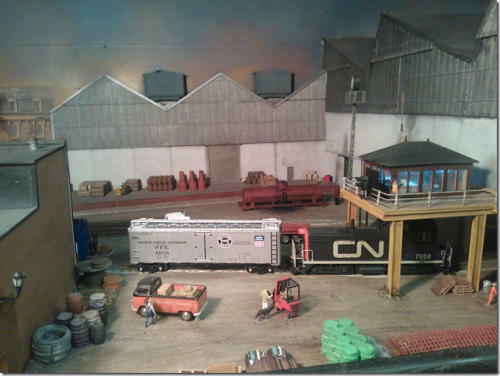 The layout was controlled by DCC and some of the locomotives had sound. The lighting changed continuously using a theatrical DMX lighting system. 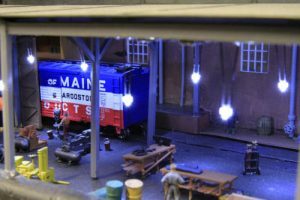 The Floor Area required for the layout was 4.30m x 2m and was operated from the front.